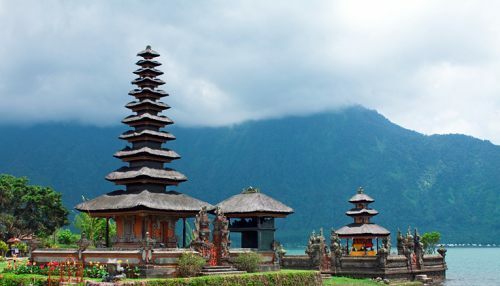 Singapore Airlines is showing flights in September 2019 from Seattle to Denpasar (Bali), Indonesia for $634 CAD roundtrip including taxes. I wouldn't normally post about a $600-something roundtrip flight from Seattle to Bali. It's an excellent price to be sure, but once in a blue moon there are $550/$600-something roundtrip flights from Vancouver to Bali. The reason I'm posting about them is because the flights are with Singapore Airlines, often regarded in the Top 5 of airlines worldwide. In fact, this year, they were ranked the #1 airline in the world for the fourth time, by SkyTrax. 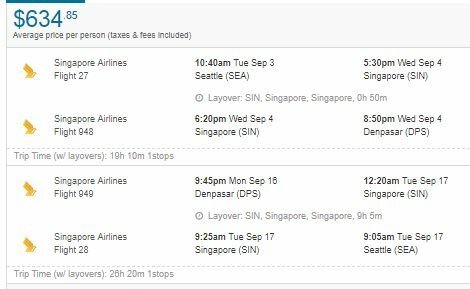 From Vancouver, a flight with Singapore Airlines to anywhere in Southeast Asia will usually cost you a minimum of about $1800 CAD roundtrip. So if you've ever wanted to fly with Singapore Airlines (and you also want to go to Bali of course! ), these could be worth the drive down to Seattle. The flights have 1 stop each way, in Singapore, for 1 hour on the way there, and 9 hours on the way home. September is the tail end of the dry season in Bali, as the rain starts to pick up in October. -- Bangkok, Thailand (BKK) -- $588 CAD roundtrip, 9 hour layover on the way back, rainy season! -- Manila, Philippines (MNL) -- $598 CAD roundtrip, 11 hour layover on the way back, rainy season! Oct 17 to Oct 29 -- new! Oct 24 to Nov 5 -- new! flight deals, seattle, sea, asia, bangkok, thailand, bkk, southeast asia, bali, denpasar, dps, indonesia, singapore, sin, kuala lumpur, kul, jakarta, cgk, manila, philippines, mnl and singapore airlines. One Response to "Seattle to Denpasar / Bali, Indonesia and other places in SE Asia - $598 to $634 CAD roundtrip | 5* Singapore Airlines"
Can I ask if you will be interested to know "how your website yvrdeals.com can be setup with some Ninja Video Marketing technique that will pull in tons of qualified leads everyday for your business on autopilot basis..." ?